FOR IMMEDIATE RELEASE — February 11, 2015 — Pet International of Miami, Florida is recalling 1500 units of 6” Beef Trachea Pet Treat because it has the potential to be contaminated with Salmonella. Salmonella can affect animals (i.e. dogs) eating the products and there is risk to humans from handling contaminated pet products, especially if they have not thoroughly washed their hands after having contact with the products or any surfaces exposed to these products. Dogs with Salmonella infections may be lethargic and have diarrhea or bloody diarrhea, fever, and vomiting. Some pets (i.e. dogs) will have only decreased appetite, fever and abdominal pain. Infected but otherwise healthy pets can be carriers and infect other animals or humans. If your dog has consumed the recalled product and has these symptoms, please contact your veterinarian. The 6” Beef Trachea Pet Treat was distributed to retail stores in the following Cities: Conifer, and Lakewood in Colorado. If you have this product, use gloves and put in a double bag and throw it away as soon as possible. Do not touch the product in any way, and if you do, it’s recommended you must wash your hands immediately with an antibacterial soap. No illnesses have been reported to date. We are still warning consumers that if any of the above information is on the package you have, do not feed it to any animals at all. It may be hazardous and should be disposed of immediately. The recall was as the result of a routine sampling program by the Colorado Department of Agriculture and analyzed by FDA, obtained from Buster’s Natural Pet Supply in Conifer, CO. and found to be positive for Salmonella. The product sampled had a Buster’s Label on it, but was manufactured by Pet International. Buster’s Natural Pet Supply recalled the entire product from the two stores that the distributor sells it. The Pet International Inc. continues their investigation as to what caused the problem. 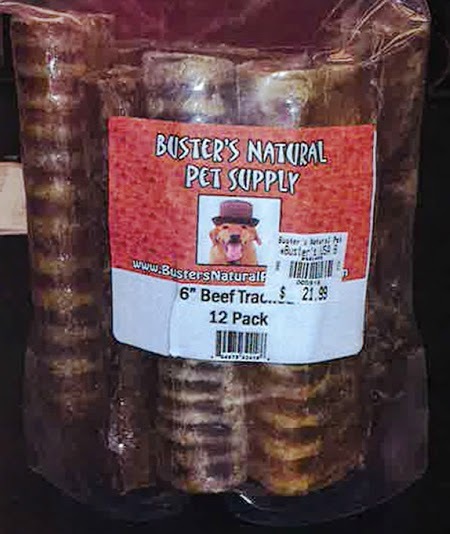 Consumers who have purchased 6” Beef Trachea with Buster’s Natural Pet Supply Label on it and are wishing to be refunded because of the recall, can take the product back to where bought it from, with receipt. A special form will be provided to be filled out as well. Both the form and the receipt are needed for the refund. Consumers with any questions about the recall product may contact the company at by phone at (305) 591-3338 Monday through Friday 9:00am too 5:00pm EST or via e-mail at sergioh@petint.com.